Yesterday, while chatting with a friend, I became anxious about the need to enroll our girls for swim lessons, ballet lessons, and gymnastics. The season for swim lessons is coming to a close and so I recognized this would be a task for next summer. But ballet and gymnastics? A definite must. I contacted a few ballet studios during a work break and googled some gymnastics gyms. I was determined to get my girls active and enrolled for the fall term, and of course with the Olympics about to begin, I can’t help but think of raising an olympic gymnast, gold medal-winner, Dani Davidson! (Thanks to a vision from my brother, Daniel Pryfogle). Yesterday evening, while sitting down to remind my husband about how important it was for the girls to do ballet and gymnastics, I was instead faced with a critical wake up call. Yes, ballet, gymnastics and swimming are incredibly valuable for children. But in reality, this is not our family. We do not have the time or resources to enroll our children in every extracurricular activity (not to mention the fact that they are currently only 2 and 3 years old. Slow down, Mommy!). With this reality check, I was disappointed. I have for many years envisioned a perfect and organized home, with a Mommy’s calendar, filled with practices and classes for each child. I wanted to be a home with routines and schedules–Bible Study every Wednesday, Family Game Night every Friday, trips to the library every Saturday morning, Ballet & Gymnastics on Tuesdays and Thursdays…and so it goes. Filling up the schedule with what the world says is a healthy normal family. I have longed for the family life of another, never fully realizing the value of our own family and our home–perhaps a struggle that many others experience as well. The addictive nature of Pinterest leads us to covet thy neighbors recipe, thy neighbors home decor, and thy neighbors DIY Crafts. Perfect cooking. Perfectly organized homes. Perfect crafts, gift ideas, and projects for children. Not to mention blog after blog from soccer mom’s, swim teams, and dance studios proclaiming the value of activities. But we are not that family. We do not have a perfectly decorated and organized home. I do not sow, or knit, or crochet, or paint. I am not a gourmet cook and I do not have time to craft my children’s school lunches into the shape of Dora the Explorer or Elmo. Our children are not star athletes or diva ballerinas. And I do not have a perfectly organized Mom calendar. And it’s ok. We are not that family. We are a family who studies theology, family therapy, psychology, law, and graphic design. We are a family who reads good books, colors and scrapbooks, and attempts to garden. We are a family who serves in ministry and visits with friends and family. We are a family who goes for walks, swims at the lake, plays in the backyard, builds forts in the bedroom, and has Veggie Tales Dance parties in the living room. Our children may not get athletic scholarships to college or a dance scholarships to Juliard, but they will have a passion for studying God’s word, for learning, for exploring, for creating, for writing, and for loving and serving others. And really, what more could I ask for. And so, this is another step in letting go. Letting go of the coveting nature, overwhelmed with the desire to have someone else’s life, and rather embracing the beautiful life that God has given our precious family. Thank you Lord Jesus for the abundant life that you bless us with each day. May you be glorified this day as I find joy in you and praise you for my family! 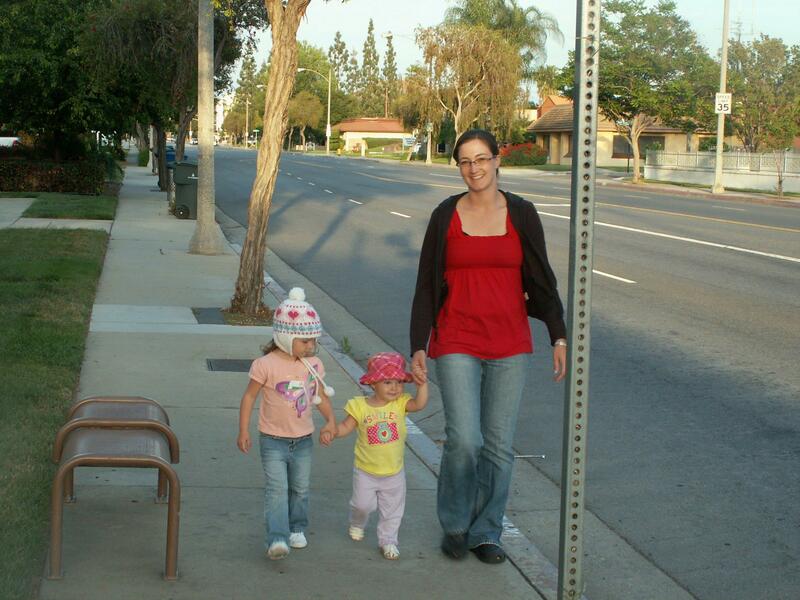 Sadie Rose, Dani, and Mommy go for a late afternoon walk. If a picture is worth a thousand words, then there are two thousand in the above photos. So I will conclude with ἀμην. I love the family you are. Yes, keep it simple. The girls are growing into young women of the Word. So thankful that the Holy Spirit leads you into all truth, and that you listen.